This Is The Storm Shelter That Is Proven To Save Lives! On April 27, 2014, an EF4 tornado struck the town of Vilonia, Arkansas. It was the second devastating tornado to hit the town in 3 years, causing wide-spread destruction & death. Seven people took shelter in a Safe Sheds storm shelter before the full force of the tornado struck them directly. Their home, several outbuildings, and many vehicles were completely destroyed. And the tornado tossed a full-sized pickup truck against the door of the storm shelter, bending it completely in half around the steel-reinforced concrete building before dropping it a few feet away in a crumpled heap. The people inside the shelter were uninjured and there was absolutely no structural damage to the storm shelter. 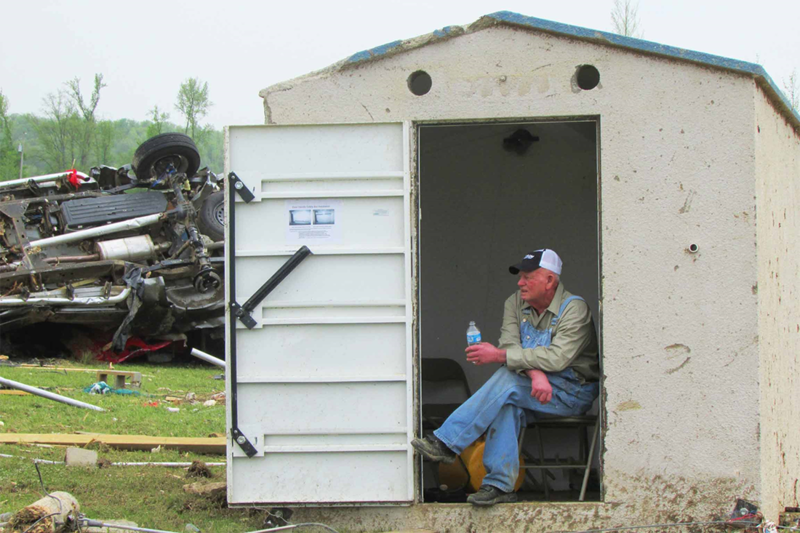 Seven people survived a direct hit by an EF4 tornado in this Safe Shed storm shelter in Vilonia, Arkansas, in April of 2014. "We could hear stuff slamming against the door and all around us...it did what it was supposed to do - save our life. This was an investment that we never regretted making. I felt safe just knowing it was there in case we needed it." Stop being afraid of what might happen to you and your family when severe weather strikes. Be Prepared...Be Safe! Put 24,000 pounds of steel-reinforced concrete between an EF5 tornado and the people who matter the most to you. Your Safe Shed storm shelter will stand up to 250 mph winds and debris. Our #1 priority is making sure you are safe when severe weather strikes. Our storm shelters are usually 15% less than comparable shelters because there's no middle man or dealer when you buy a storm shelter from Safe Sheds. When you deal with us, you're dealing directly with the manufacturer, so there's no dealer markup. We look for ways to save you money and often give additional delivery discounts even after your contract has been signed - ask about dual delivery savings! At Safe Sheds, we do one thing, and we do it right. We build, sell, and deliver above ground concrete storm shelters. Period. And we've been doing it since 2002, so you can rest assured that we're great at what we do, and we'll be around for years to come. Our employees know that their work saves lives! We respect you...whether you're contacting us for the first time to get a quote, you're calling with questions about a contract, or you've referred a new customer to us. It's our promise that we will treat you the way we want to be treated, with honesty and no high-pressure, pushy sales calls. "Rex and Cheryl were fantastic to work with, very patient with no pressure or sales pitch. In today's world, customer service is quickly becoming a lost art...many businesses could learn from Safe Sheds' service model." We'd be happy to put you in touch with a Safe Shed owner in your area. You ca​n visit their home to see a Safe Shed for yourself. Just "click" below! 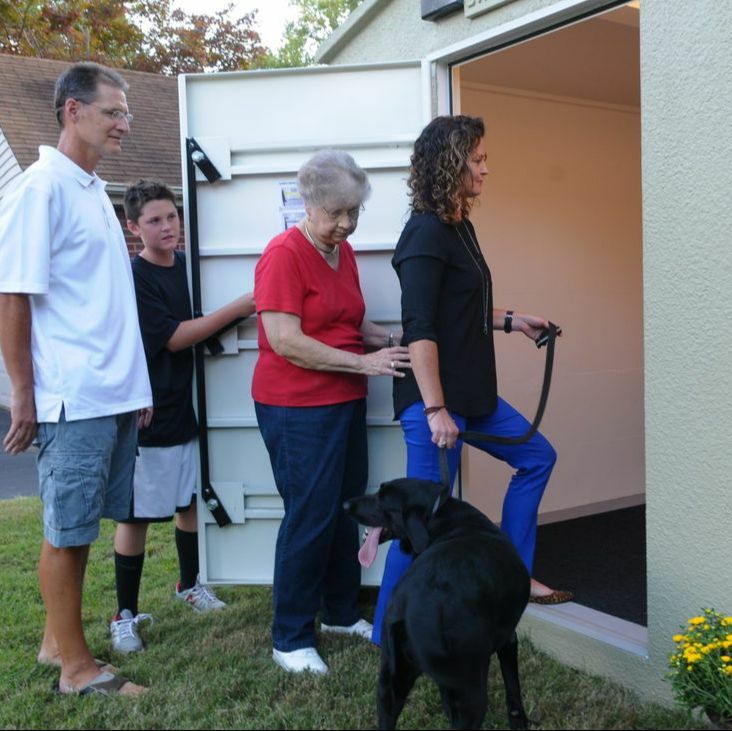 Easy access, pet-friendly above ground storm shelters install quickly and affordably. "Very good people, like dealing with friends, from start to finish." Don't just take our word for it. Read the letters sent by our customers who've used their Safe Shed storm shelters during severe weather. Ask our sales staff for the name and number of a Safe Shed owner and call them yourself. Find out why they chose Safe Sheds, how they use their shelter, and what their experience has been with our company and our storm shelters.